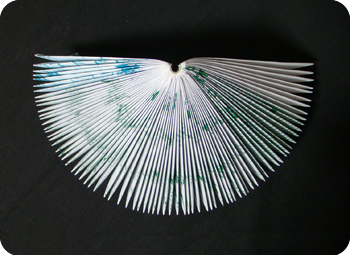 Spinning Top is one of the easiest book sculptures you can make so it’s a good one to start with. If you have children and happen to be on an airplane, this project is perfect because it is easy, takes a fair amount of time, and will result in an unexpectedly stunning sculpture. All made by folding (no scissors on an airplane!). It’s origami with a spin! 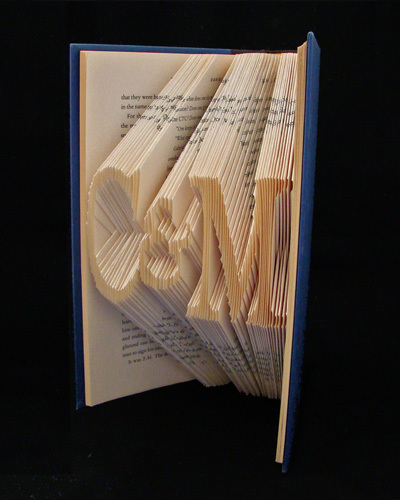 Generally, book sculptures or altered books are books which have been transformed into incredible pieces of art. 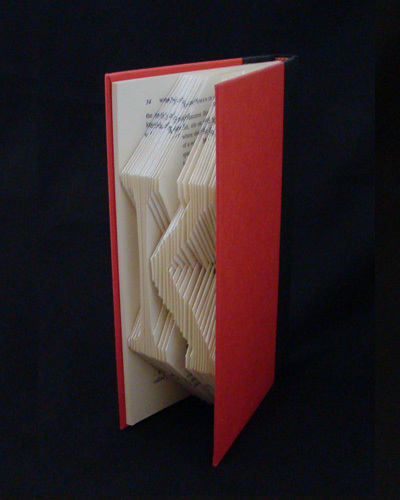 Altered books often include the use of scissors and/or glue; however, this design was made by folding only. Take a book and remove the front and back cover but leave the pages bound together. 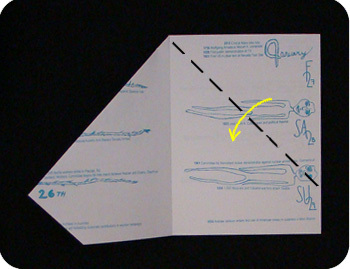 Without ripping off the pages, remove small bits of binding glue that may still be adhering to the spine of the book. The book used here was a day-planner donated by Slingshot. 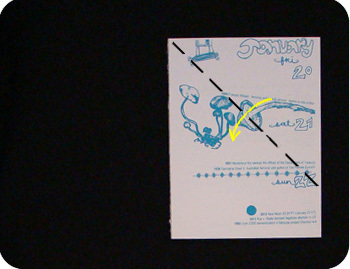 Fold down the top corner of the page so the top edge of the page meets with the spine of the book. 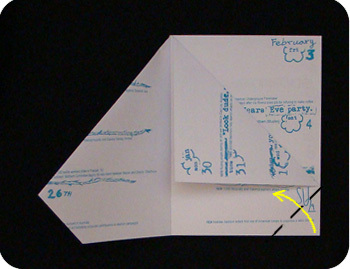 Fold up the bottom corner of the page so the right edge of the paper is flush with the flap made above. 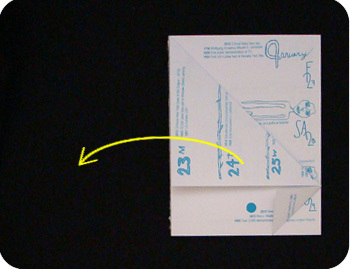 Repeat: fold the top corner down so the top edge of the page meets the spine. and turn the page. Repeat this procedure until all the pages are done. This is how it looks like with 4 pages done. 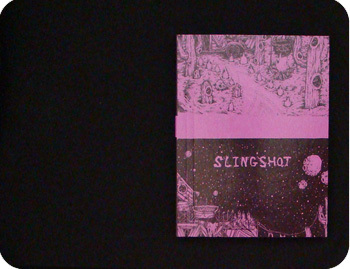 Side view with all the pages folded. The look of your sculpture will be different depending on the dimensions of your book and the number of pages in your book. 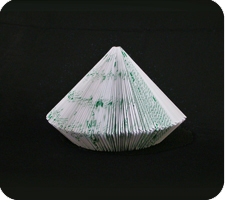 A squarish book will have almost no bottom and will look almost like a wide-based cone. A tall, skinny book will have a more prominent bottom like that of the Lantern design. Indeed, if the book is too tall compared to its width, the geometry would not allow you to make the Spinning Top at all: the resulting sculpture may look more like the Quartz design. 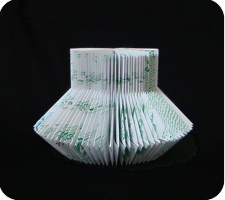 A book with more pages or thicker paper may take up more space and produce a sculpture with 360 degree rotation (as in the case of the Tree design. 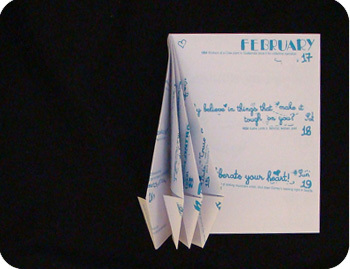 Here, the day-planner had about 80 pages of medium weight paper. 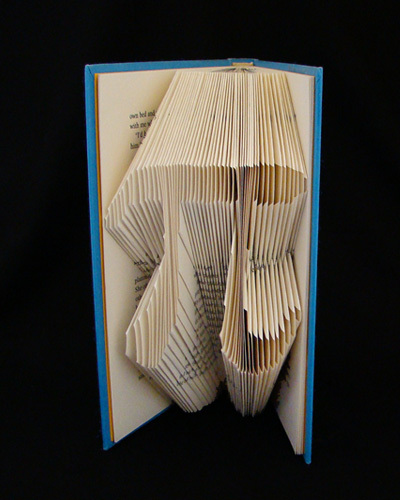 Book sculptures or altered books are often created by modifying the pages of a book while the pages are still bound together. You can cut, fold, paint, and do all sorts of interesting things with the paper to create beautiful structures. 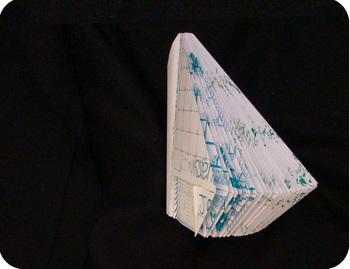 The book sculptures on this web site are made by folding only.